Composi-Tight 3D XR Sectional Matrix System is designed to create tight, anatomical contacts on Class II composite restorations. The rings in the 3D XR system are produced with Soft Face™ silicone to enhance matrix band adaptation and improve contacts, reducing flash and finishing time. The 3D XR Ring (blue tip) is an ultra-retentive matrix ring designed for use on short or malpositioned teeth, primary teeth and in areas between the canine and first bicuspid. The 3D XR Ring also works well with standard height teeth. The 3D Ring (orange tip) is indicated for use in most circumstances as it adapts to a variety of tooth anatomies. Composi-Tight 3D XR and 3D Rings are angled to allow stackability in any combination for MOD and multiple-tooth restorations. 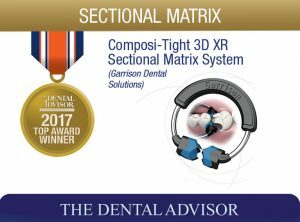 The Composi-Tight 3D XR Sectional Matrix System is available in a variety of kit configurations. 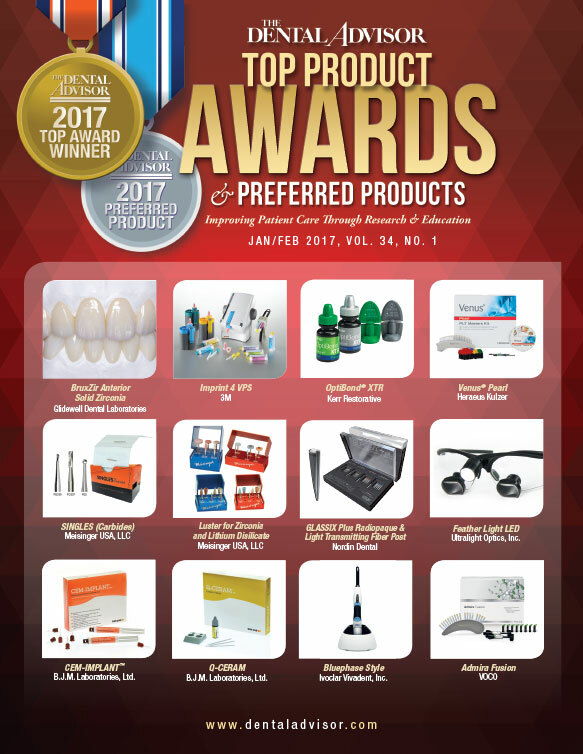 The complete kit includes one 3D XR Ring, two 3D Rings, 20 FenderWedge interproximal tooth shields, matrix band forceps, ring placement forceps and a multi-function composite instrument. Composi-Tight 3D XR Sectional Matrix System was evaluated by 14 consultants in 359 uses. 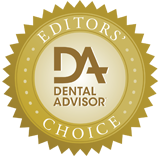 This sectional matrix system received a 96% clinical rating. The new blue Composi-Tight Soft Face 3D XR Rings were very retentive, even on short teeth. The soft silicone on the rings contributed to adaptation of the bands to the teeth and reduced the amount of flash in interproximal areas. The slick bands were easy to place and prevented composite from sticking to the surface. Consultants found the blue rings more stable than the orange rings and preferred them overwhelmingly. They were effective in all areas of the mouth. The main challenges with this system were on wide buccal-lingual preparations.The kit was very complete and contained everything needed for matrix procedures. Fifty-seven percent of consultants rated Composi-Tight 3D XR Sectional Matrix System better than other sectional matrix systems they were using and 29% rated it equivalent. Seventy-one percent would switch to Composi-Tight 3D XR Sectional Matrix System and 86% would recommend it to a colleague.